that expand into soft cloths to clean up messes wherever you go. You can use variously with warm water or salt water..
Made of 100% natural cellulose derived material, Aqua Tissue is safe for all types of skin. With regular wet tissues, bacteria and fungus can easily form. it is guarantee that every tissue is clean and safe. 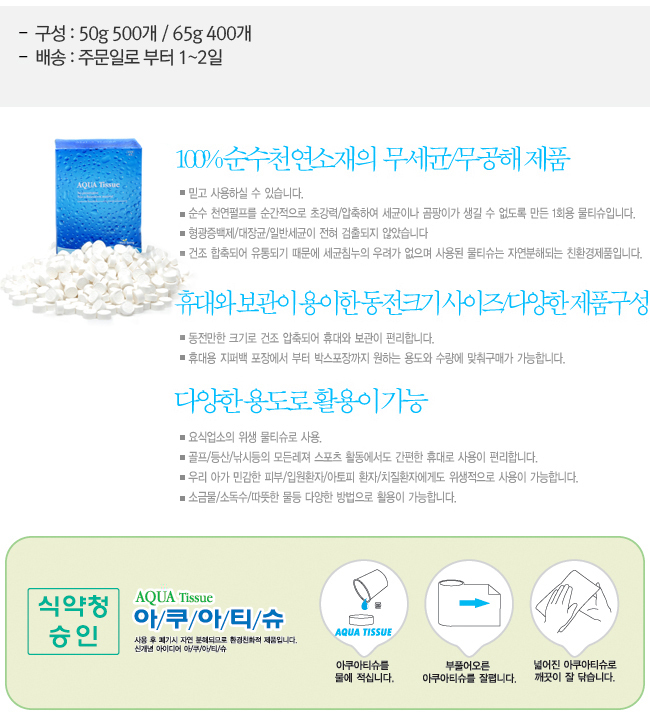 Aqua Tissue is most sanitary because no addictives or exogenous chemicals are included in the product. Being compressed, Aqua Tissue is portable, enabling you to fully enjoy your activities with no worries or hassle. Aqua Tissue is innovative and sanitary. From a dry compressed shape, it transform into a wet tissue with just a small amount of water.